I finished yet another Lazy Girl Designs' Chelsea Backpack for my niece, Emily's, 4th birthday. Emily told me her favorite colors were purple and red. Since she's only 4, and her mom may end up using this backpack more than she does, I did not select any "juvenile" patterns. I did purchase the beaded pin in a clearance bin at JoAnn's (and that seemed to be what Emily liked best about the backpack so far. This is the 6th Chelsea I've made so far. (click here to see the other Lazy Girl bags in my Flickr set .) I usually like to make the cover from a home dec fabric; I've used corduroy in the past. For this one, I used a stretch denim remnant and only quilted it in vertical channels. Emily's mom had told me she needed a backpack for when she started pre-K this year. 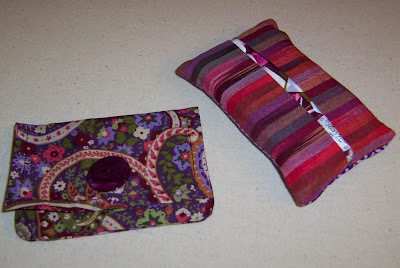 Of course, every young lady needs some accessories, so I made her a coordinated Wonder Wallet (also a Lazy Girl pattern) and a pocket tissue holder. I didn't embroider the 'E' on the tissue holder . . . it was a fusible appliqué left over from some previous project. This was my first Wonder Wallet, but I think I'll be making a few more . . . they might even be worthy of my precious Mets fabric! I still have at least one more Chelsea to make, this one for Laurie -- I've promised it in time for her birthday which is September, so I'd better get started soon! I keep hearing she likes yellow . . . so I'll have to find some cool fabrics in yellow. Hmm, sounds like a good reason to go shopping! Thanks for visiting! The Chelsea backpack is a pattern from Lazy Girl Designs. 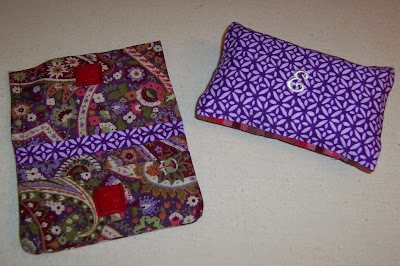 You can find more info about the pattern and how to buy a copy at the Lazy Girl Designs website. The pattern instructions are very clear and easy to follow, but if you have questions while making the backpack, visit the Lazy Girl blog or join the Lazy Girl yahoo group (see the link on my sidebar) for help from lots of creative and talented Lazies!